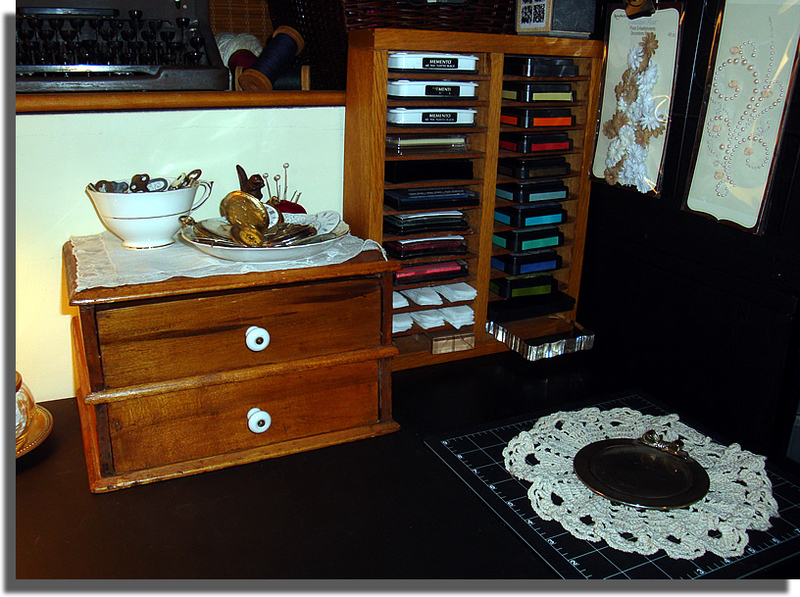 Today I am going to feature the right side of my studio: my sewing / stamping area. As usual, click on the images for larger versions. I got this desk from my aunt when she moved into a senior home a few years ago. I love the single large drawer with antique pulls. It's great to have the extra space to stamp or sew. 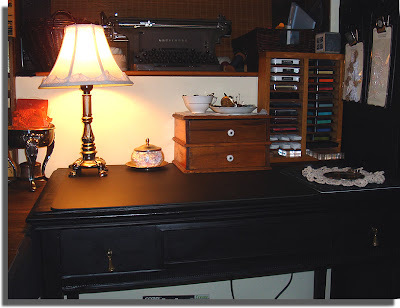 I used to keep my sewing machine on it all the time, but recently placed the machine on the floor underneath until I need to use it. The small table lamp was also my aunt's. For years my daughter had it in her bedroom, so we bought a new shade for it back then. 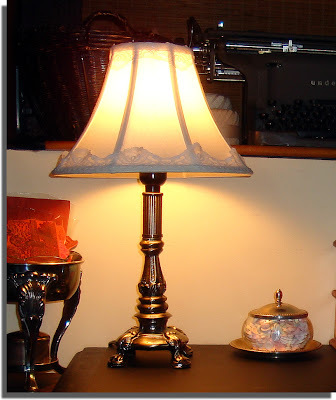 Yesterday I used some of the lace I found at the thrift store and added it to the shade... I love the way it softened the look! The two drawer cabinet is a recent eBay find... I was the only bidder and got it so cheap! I was amazed. 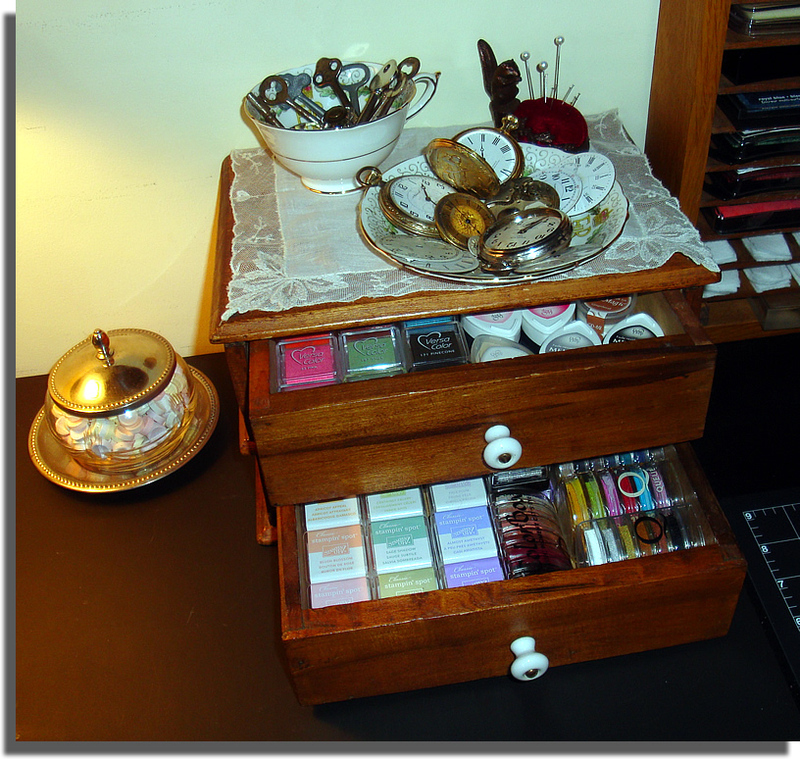 It matches my watchmaker's cabinet on the main desk; with those white porcelain pulls - and holds my small inkpads perfectly! 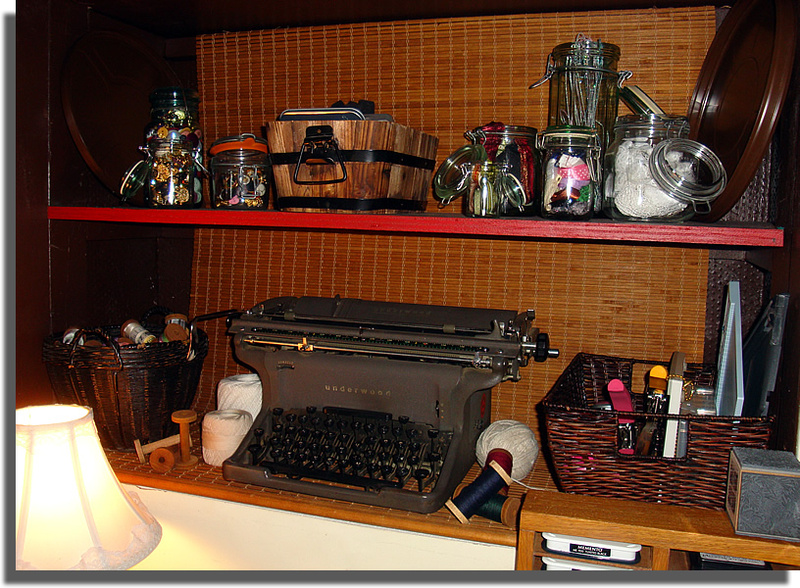 I topped it off with a vintage handkerchief I found at a local antique shop; they had a basket full for $2 each. The Queen Elizabeth II commemorative teacup and saucer hold my collection of watches, watch faces and vintage keys. Come to think of it, the teacup also came from my aunt! One of my favorite finds on eBay is that little squirrel pincushion. 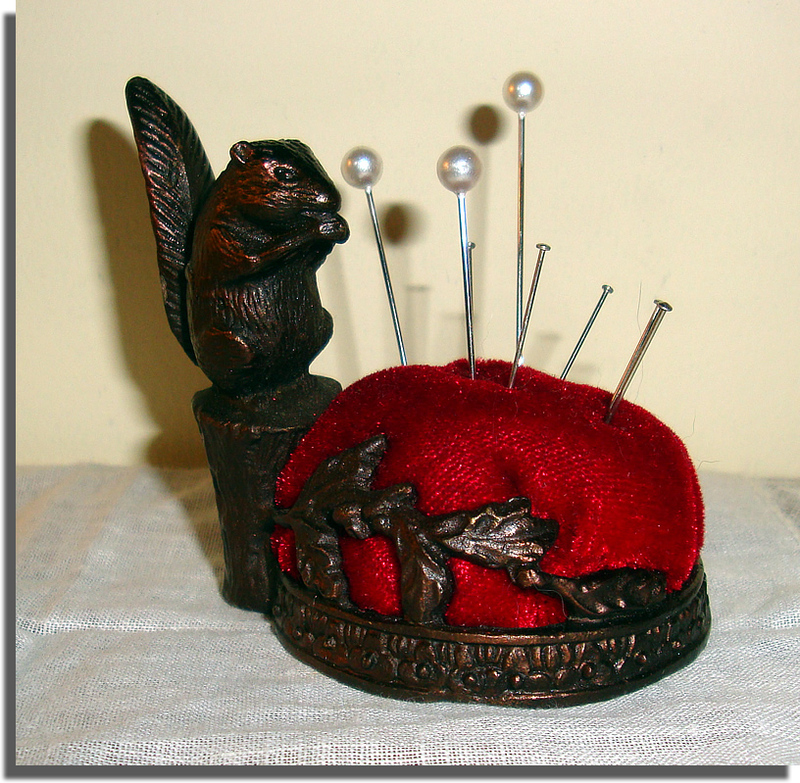 It was an estate find in Colorado; with a copper base and velvet cushion... I just HAD to have it! 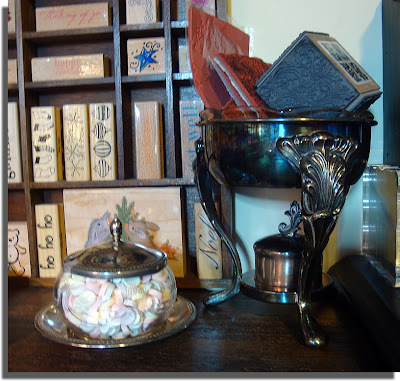 The small shelf holding my Tim Holtz inkpads was found just last week for a couple of bucks at the thrift store. The other thrift store finds on the desk are the candy dish (yes, it used to be on my main desk but I moved it yesterday -- I am always re-arranging things!) and the silver tray with bow. The final item from another aunt is the doily... a nice remembrance of her since she passed over 10 years ago now. 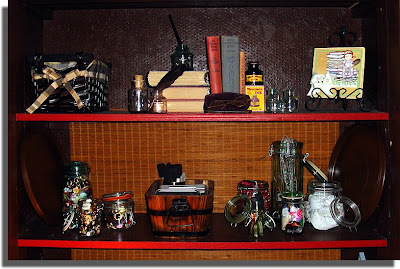 The top shelf displays some vintage books (a 1939 edition of Gone With The Wind is my treasure), some antique ink bottles and a pair of old spectacles. I hope you've enjoyed this update. More will come soon! As promised last time, here are the rest of the antiques I have on the main desk in my studio. As always, click on the images to biggify. First, here are two thrift store finds - a glass and silver sugar bowl I use for candy (well, it HAS sugar in it, no??). I always have to have some kind of treat while I work....*ahem*. I recently found this chafing dish, minus the actual dish however... for a couple of bucks, I thought why not use it paired with a glass bowl (another thrifty find) to hold stamps? I love the heavy, ornate design! 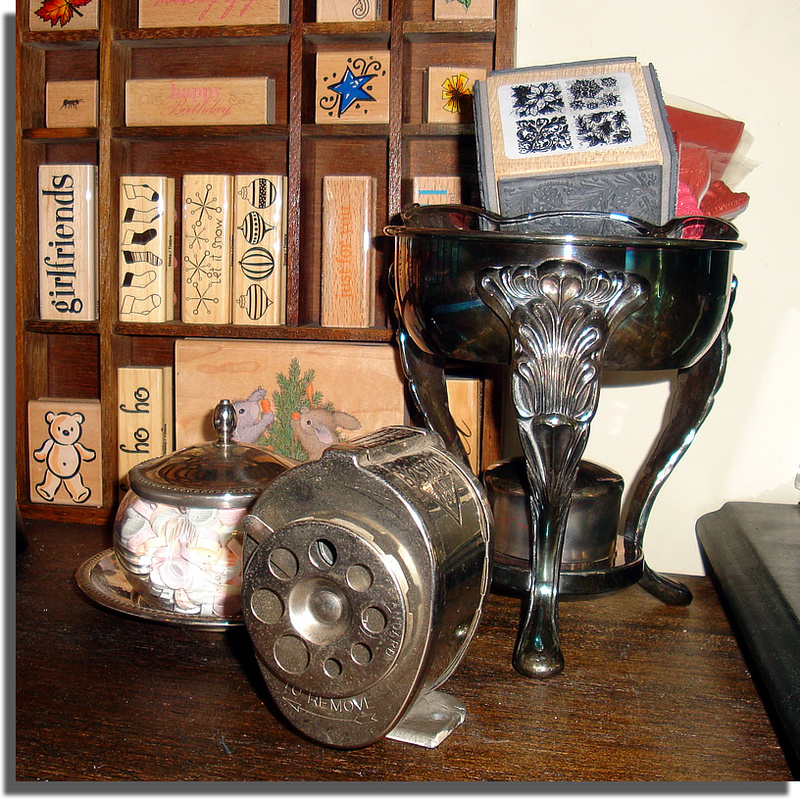 One of the first antique desk accessories I purchased last fall was this Achilles stamp holder. 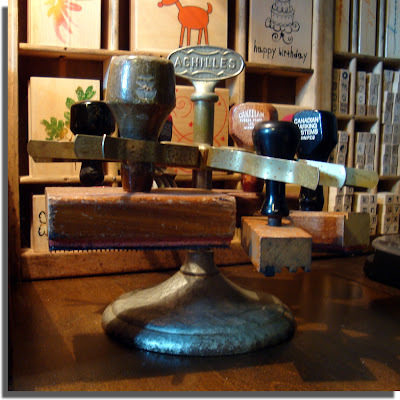 I just LOVE it to hold my old stampers. Many of these I have replaced the rubber mount with a strip of velcro to hold felt pads for inking projects (aka a homemade version of the Tim Holtz blenders). Here is my antique paper cutter. I had been looking for one of these for awhile, but some were very large and expensive. Then I came across this small 9" model at a very reasonable cost on eBay. This type of tool was used in grocer or butcher shops to hold and tear brown paper wrapping. I use it to hold my paper towels. I added the string spool on top and used the hook on the side to hang a metal ruler. That scoop behind it I found for $4 tucked away at a local antique shop... right now it is hanging off the side of my other desk. 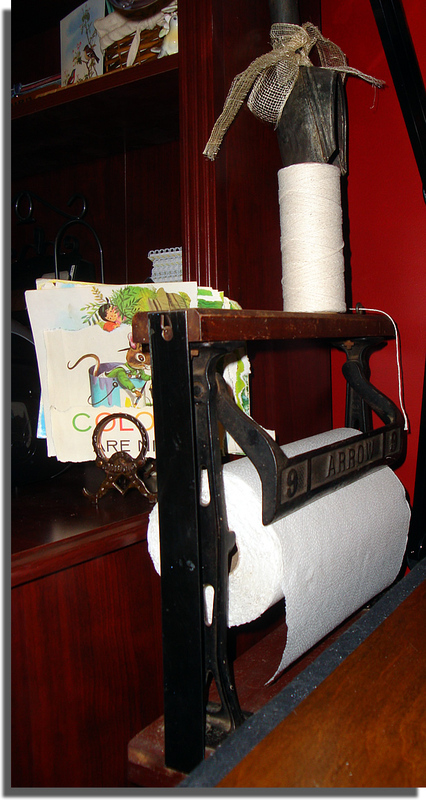 The other item you may note behind the cutter is an 1880s wire letter rack. It holds a few pages torn from an old children's book (which was ruined by a child's scribbles all over it, so I didn't feel bad tearing out the good pages) that I'll probably use to illustrate cards with. 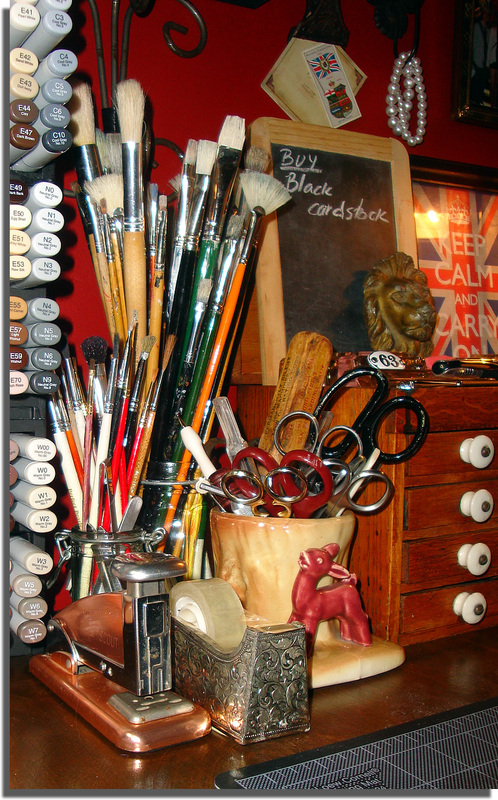 Well, I think that now covers most of the antiques on my main desk... until I find more, that is! 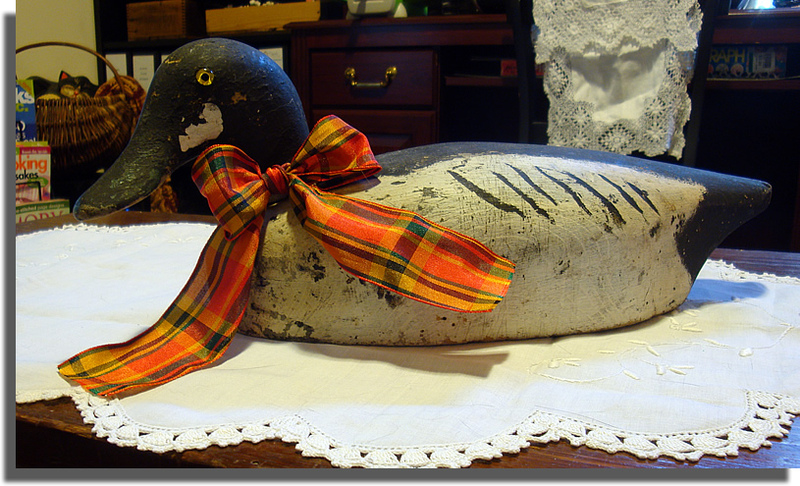 I found this Drake Whistler decoy at a local antique store and mentioned it to hubby... what a perfect addition to my studio! I added the bow and he now adorns a cedar chest I use for a coffee table. Of course, I named him "Drake"! Well, that's the tour for today. I promise not to keep you waiting nearly a month for Part 3... I'll be posting it in the next few days.